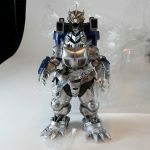 1madzilla reviews the Toho 30cm Series Mechagodzilla (Kiryu) 2002 Night Time Version vinyl figure by X-Plus. • See more videos at the 1madzilla YouTube Channel. 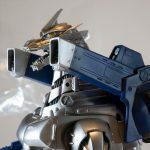 Gojira851 reviews the Toho 30cm Series Kiryu 2002 Heavy Arms Version (東宝30cmシリーズ 「3式機龍（重武装型）」) North American (Diamond) Reissue vinyl figure by X-Plus. Today at the Toy Fair trade show in New York, Diamond Distributors revealed the next set of X-Plus vinyl figures slated for North American release. These figures are reissues of Japanese releases, now licensed for sale only in the United States and Canada. This crazy awesome piece was originally released in March 2016. 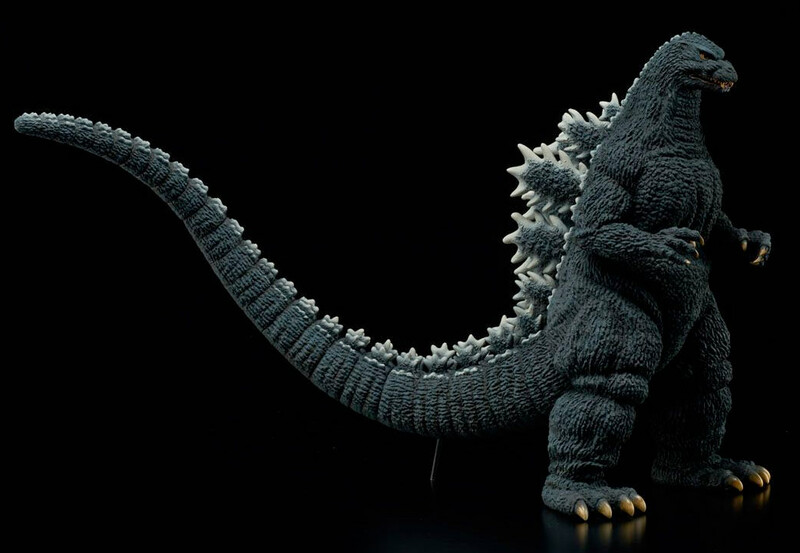 It features a monochrome paint scheme and stylized sculpt of the original King of Monsters chomping on a train. At 11.5 inches tall, it’s noticeably shorter than the rest of the figures in this series. It’s X-Plus’ first stylized piece in the 30cm Series, but don’t let that scare you away. If you’ll pardon the anathema, this sculpt improves on the 1954 design. But, yes, if you are an accuracy freak you might want to skip this one. But you’d be missing out on some serious badassery. • Pre-order the 12in Series Godzilla 1954 Train Biter at Flossie’s. 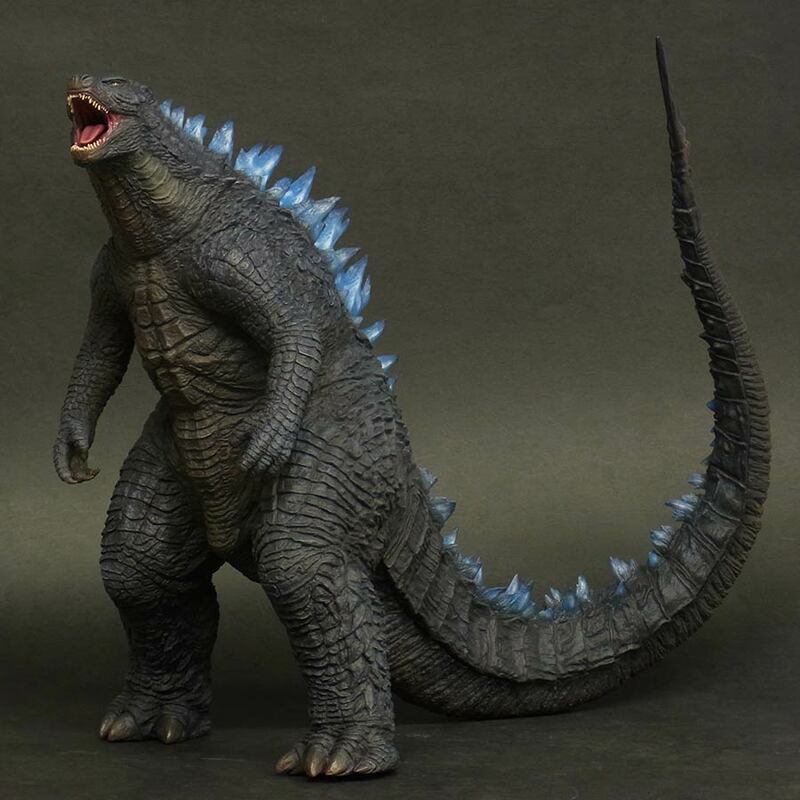 The Toho 30cm Series Godzilla 2014 “Roar Version” was first released in Japan in February 2016. 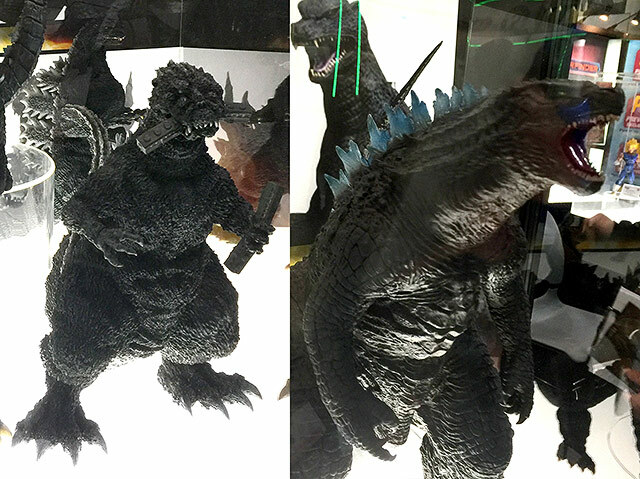 It has the same sculpt as the original Godzilla 2014 which X-Plus put out in July 2015, but with an upturned head in a roaring pose. This “roar” version also sports translucent fins tinted blue to mimic their look when charging up for a puff of atomic breath. 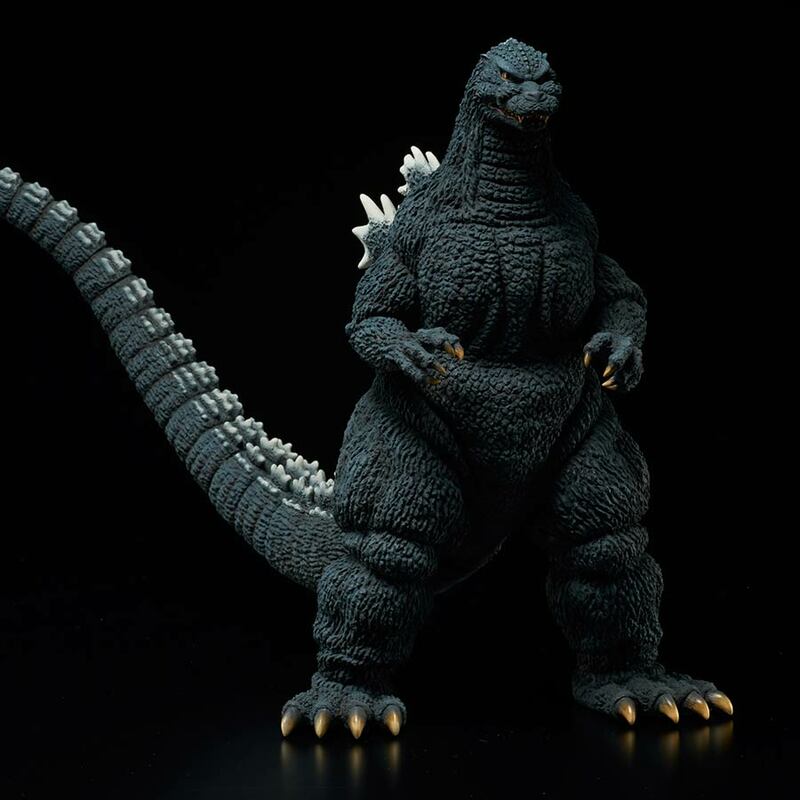 The figure’s pose makes it 13 inches tall and one of the tallest in the series. 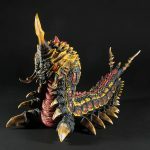 The original sculpt with regular black fins is already set to come out from Diamond in June and can be pre-ordered now. 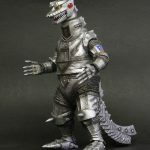 X-Plus originally released the Toho 30cm Series Mechagodzilla 1975 just last year in August. And, now everyone will get another crack at him. 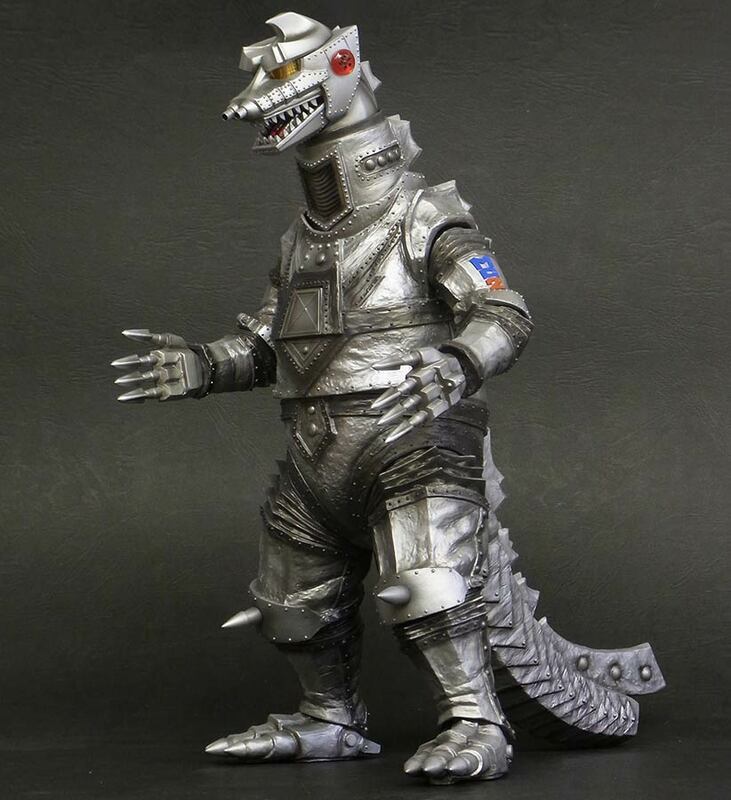 This awesome, awesome, awesome figure, based on his second appearance in Terror of Mechagodzilla offers a rougher sculpt and shinier paint than on the 1974 version and doesn’t need a base to stand like the ’74 does. • Pre-order the 12in Series Mechagodzilla 1975 at Flossie’s. 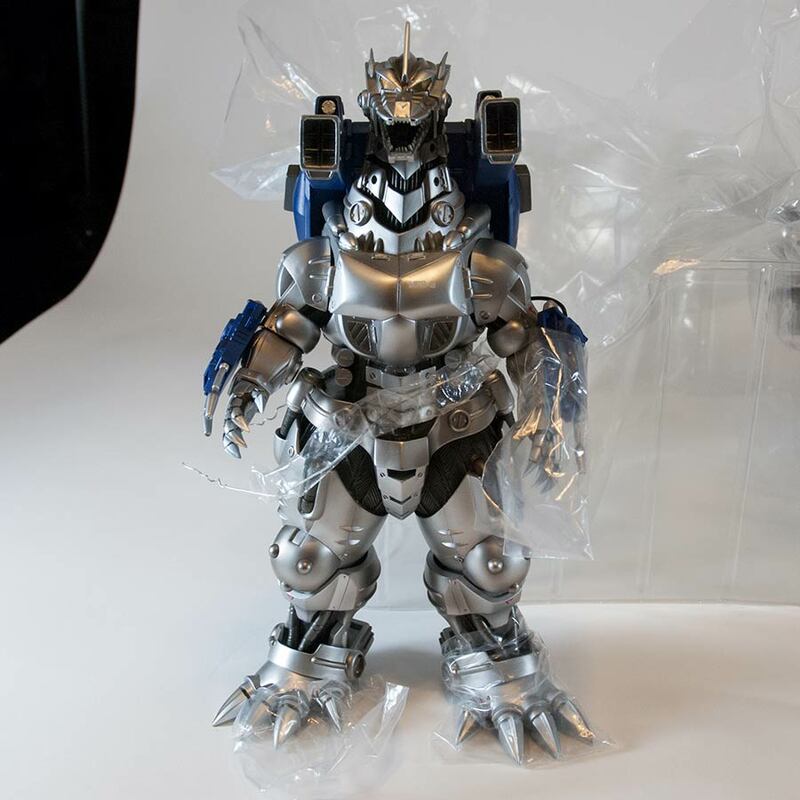 X-Plus first released their Kiryu 2002, complete with blue jet and cannon pack as a resin piece way back in 2012. It was later released, in vinyl this time, as a very limited Summer Wonder Festival Exclusive in 2015. Not so exclusive anymore, eh? 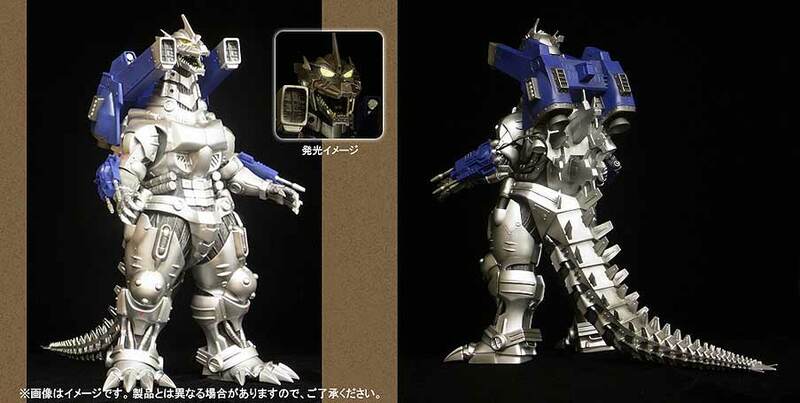 It will have articulation in only the shoulders and wrists. Trust me, this thing is amazing. Even if you’re not big on Kiryu, this figure just might win you over. I could be wrong but I think the blue jet pack can not be removed. If you want a clean-look Kiryu, you can order the 2003 version. It’s available to order and ship right now from stores in the U.S. and Canada. 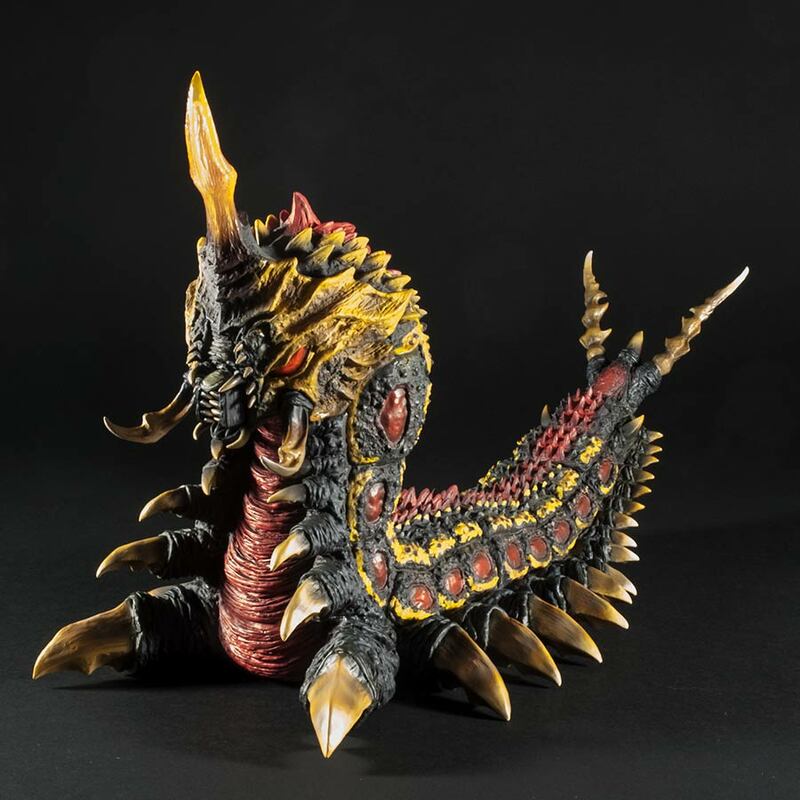 Based on 1992’s Godzilla vs. Mothra, the Toho 30cm Series Battra Larva was first unleashed in early summer 2016. It’s 12inches tall from the tip of its translucent horn and a whopping 21 inches long! It may not see eye to eye with Godzilla, but this thing is BIG! I would not be surprised if this figure breaks Diamond’s current $200 SRP ceiling. Match this figure up with the 12in Series Godzilla 1992 (which is available in the U.S. right now). Or, if you want to be really accurate, with the Yuji Sakai Godzilla 1991 (Expected to be released by Diamond this April) since that was actually the suit used in the fight sequence at sea while Battra was still in its larval stage. • Pre-order the 12in Series Battra at Flossie’s. Talk about double dipping! 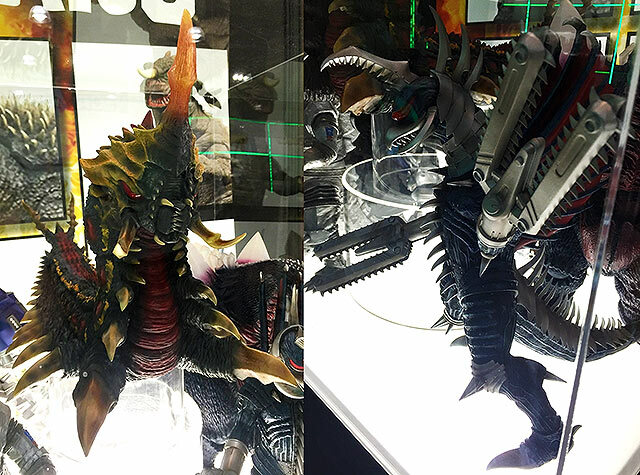 The Toho 30cm Series Gigan 2004 (from Godzilla: Final Wars) was reissued by X-Plus and Diamond just last year. X-Plus is now set to release the same figure again, but with it’s RIC exclusive alternate parts: the second head and it’s buzzsaw arms permanently attached. 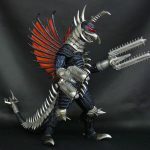 The earlier stage of Gigan 2004, with its first head and more classic-style, bladed arms is available to purchase right now from stores in the U.S. and Canada. 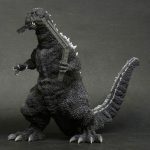 Although I don’t have a photo of it on display at Toy Fest, the Toho 30cm Series Yuji Sakai Modeling Collection Godzilla 1992 will also be reissued. This was just released in Japan last November. 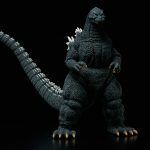 • Pre-order the 12in Series Yuji Sakai Godzilla 1992 at Flossie’s. Here is a quick gallery of bigger, cleaner shots of the figures. There is no word yet on price or expected release dates for any of these figures. But what’s the rush? We’ve got Diamond Reissues already releasing every month now through July. 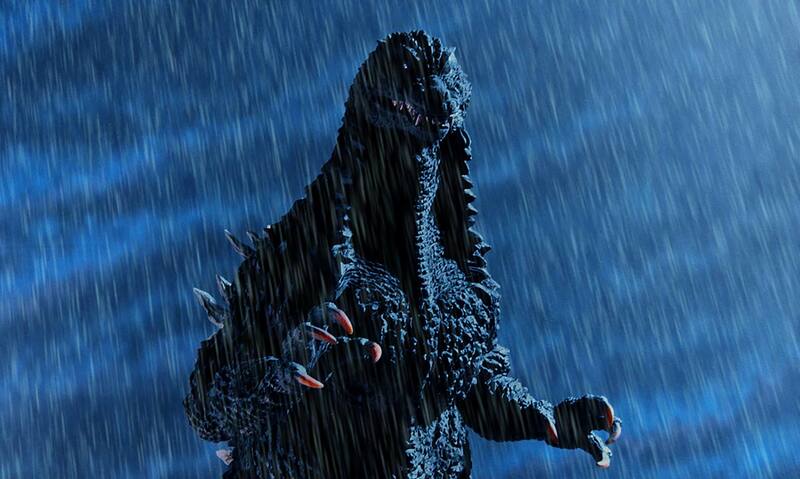 Keep checking Kaiju Addicts for more details. And please have a look at the X-Plus Diamond / Bluefin Release Schedule. X-Plus has made a Second Batch of many of the figures released by Diamond early last year. 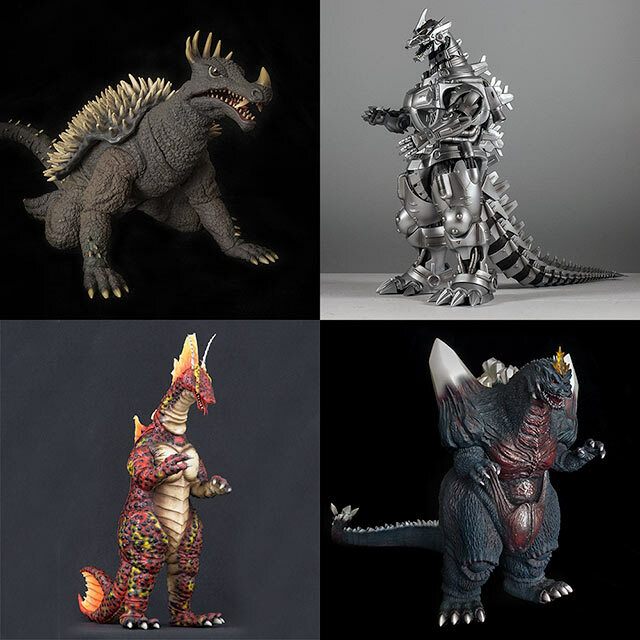 Space Godzilla, Anguirus 1968, Titanosaurus and Kiryu 2003 each had new runs and they are due to hit the Diamond warehouse any day now. The quantities are smaller than the first batch but there should be plenty to go around. You should start seeing them pop up on stores that had previously sold out. But many of these are still in stock and ready to order right now. Hideaki Anno, director of Shin Godzilla, is also the creator of Neon Genesis Evangelion, a classic anime series which also also showcased giant monsters. To celebrate this connection (or to cash in), Godzilla vs. Evangelion crossover merchandise has been popping up all over the place. And now X-Plus is participating with another set of Bandai exclusives. 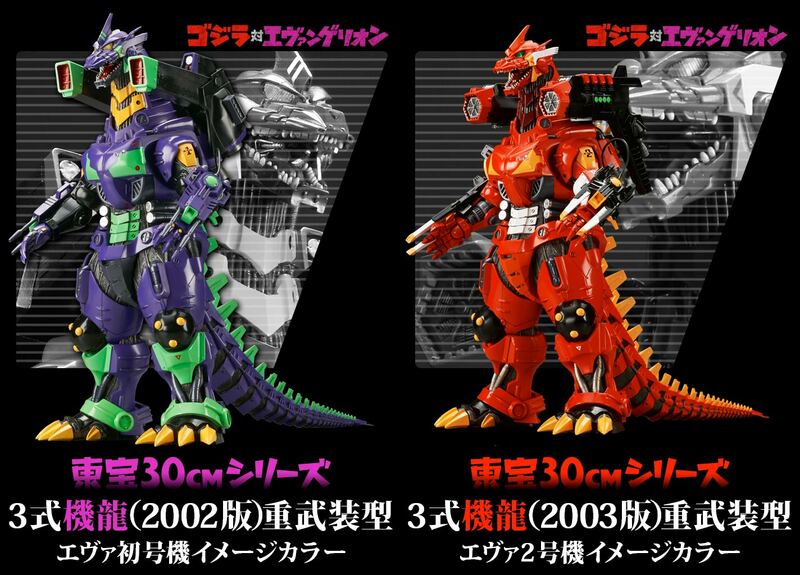 The Premium Bandai site today announced two new X-Plus re-issues which are to come doused in Evangelion colors. This figure will be released again in a playful color scheme which matches the look of Evangelion Unit 01. This “Test Type” Evangelion unit was piloted by Shinji Ikari in the classic anime series Neon Genesis Evangelion. The cost is ‎¥29,160 (Currently $268 USD). Pre-orders are open until June 2. Expected to ship in December 2016. The Tokyo SOS version of Kiryu will be out again, this time in a color scheme which matches Evangelion Unit 02, the first production model Eva piloted by Asuka Langley. The cost is ‎¥29,160 (Currently $268 USD). Pre-orders are open until June 2. Expected to ship in November 2016. 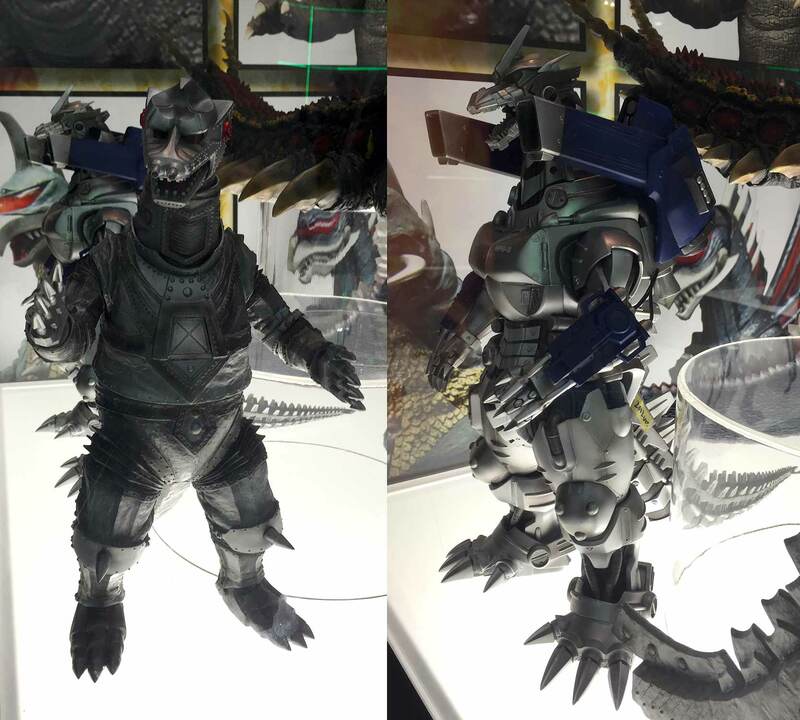 X-Plus recently announced a Wonder Festival 2015 Summer Commemorative Toho 30cm Series Kiryu 2002 RIC BOY. 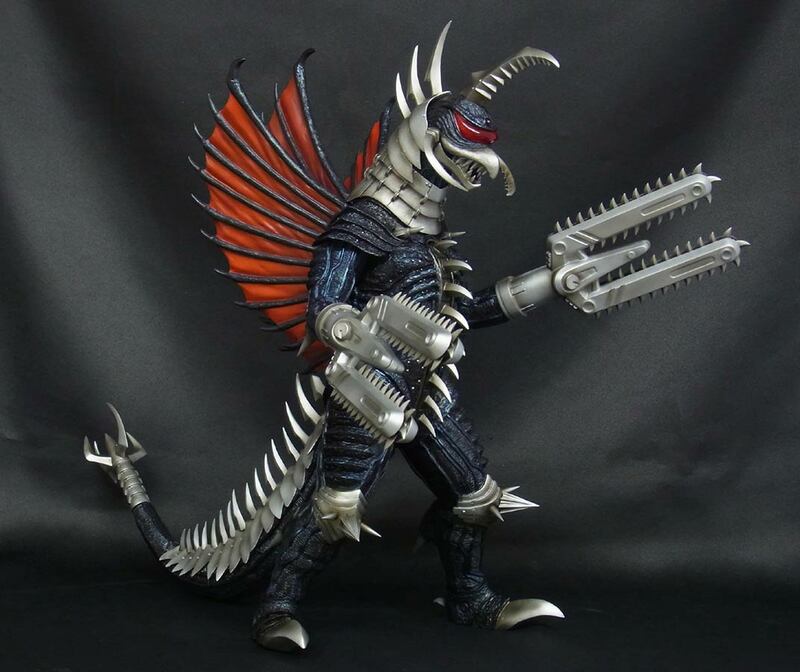 This figure represents the original “machine dragon” from his first appearance in 2002’s ゴジラ×メカゴジラ (Godzilla X Mechagodzilla). And it will be Vinyl. This figure comes with Kiryu’s original, blue back jet/missile pack and forearm guns. If that’s not enough to get you going, the figure also comes with a light gimmick which allows the figure’s yellow eyes to light-up! This figure was originally released by X-Plus in 2012, but in Polyresin form; a true statue. This is the first time it’s been slipped into vinyl. And it’s doing it for a very limited run of 100. The figure will go for ¥20,000 (currently U.S. $161.55). Not bad! But the trick is to be able to get one of them. If you are lucky enough to be in Japan, you could just go to Wonder Festival and try to be one of the first 50 people to ask for one. 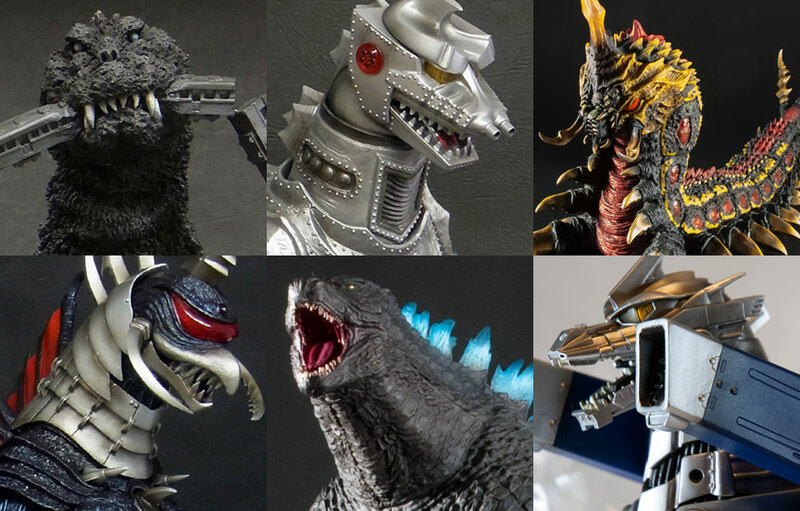 Summer Wonder Festival 2015 takes place July 26 at Makuhari Messe in Chiba. Admission is ¥2,000. Not in Japan? Then it’s the web lottery for you. Keep watching the Kiryu 2002 page on the Ric Site for the magic button to appear which will lead you to a page on their Ric store and make an order. Again, keep in mind that you may NOT be one of the 50 who will have their order honored. Also, remember that the Ric site does NOT ship outside of Japan. If you manage to start an account on their all-Japanese webstore, you’ll need a forwarding service like Tenso to use instead of your non-Japanese address. One final thing: If you can wait, Kiryu is planned for a Diamond re-issue, in vinyl, in North America sometime within the next year. No word yet on whether that will be the 2002 version or the 2003 version. Also, it’s my “guess” that it will not come with either backpack. Keep watching the Diamond Reissue Schedule for more news on that.